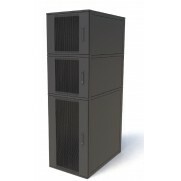 The Connectix Cabling Systems’ range of Data Centre Server Cabinets provide a flexible solution for data centre racks layouts. Design and built to the client’s configuration, the cabinets are modular and use pre-loaded and retrospective compartment options for installation. This flexibility gives Data Centre Managers maximum use of space within cabinets, maximum revenues per U of rack and best environment optimisation of rack layout. 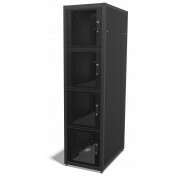 CCS Co-location Cabinets include internal vertical cable management, a large access aperture in the base and brushed cable entry positions in the roof. The cabinets support 1500kgs loading capacity and are manufactured in the UK from heavy duty frame construction on 2mm steel. Supplied with reinforced mesh doors, they can be interchanged with solid steel or advanced IP-based locking systems. Multiple rack layouts are available, please speak to your sales person so we can design a solution to fit your requirements.